A massacre in Boston. A tea party. A shot heard around the world. But who was the first casualty of the massacre? How did the tea get to Boston Harbor? What was the Battle of Concord like for a Minute Man? 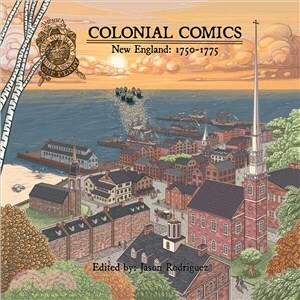 Colonial Comics: New England, 1750?1775 expands the frame of this important period of American history. Unconventional characters come to life, including gravedigging medical students, counterfeiters, female playwrights, instigators of civil disobedience, newspaper editors, college students, rum traders, freemen, and slaves. This second volume of the Colonial Comics trilogy is an artful look at what life was like in the Pre-Revolutionary period, and illustrates how the Revolutionary spirit spread to the common man and woman, one gorgeous comic story at a time. Jason Rodriguez is a writer and editor of numerous books and graphic novels, including Colonial Comics, Volume 1, District Comics: An Unconventional History of Washington, D.C., Try Looking Ahead, and Artists Against Police Brutality. His work has been nominated for an Eisner Award and 8 Harvey Awards. Colonial Comics, Volume II represents Jason Rodriguez’s most ambitious project to date. Jason lives in Arlington, VA with his wife and their two dogs, four cats, and a parrot. You can usually find him on a street corner, staring out into the future. For more on Jason’s current and future projects, visit his website at jasonrodriguez.com or connect with him on Twitter (@JayRodriguez) or on Facebook at facebook.com/Colonial-Comics.